Released for the PS3 and Xbox 360 in 2011, Metal Gear Solid 3 HD is basically Metal Gear Solid 3 in HD. As if you hadn't guessed that already. Best Foxhound Rank, Single-segment, European Extreme Difficulty Time: 1:19:25 by 'Mr_Snawk' on 2017-03-12. Best Foxhound Rank, Segmented, European Extreme Difficulty Time: 1:14:27 by 川元 'Hikari' 英則 on 2013-06-03. Foxhound Rank, Segmented, European Extreme Difficulty: 1:14:27 by 川元 'Hikari' 英則 done in 15 segments. 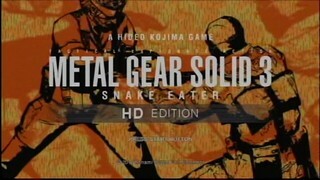 Hello all Metal Gear Solid fans! The opportunity MGS3 is, the came back is the HD version in the PS3, and to improve further improve the capture and restart the crowded spear You can also attack with full force to the limit of their own in the spirit of obstinacy, put a good record I was able. The HD version of the PS3, so that the data can be loaded by HDD, time to load is reduced, about 9 minutes time will be faster as a whole compared to the PS2 version. Do not do the reset by playing the interval to time attack and come back to it to read the HDD, if you play it from the back to the title screen again turned the game over, trick to speed up the time to read it, the time rate to be read faster you can be shortened. By the way, you can MGS2 HD version will also speed up the time to read in the same way. Finally, thanks to the staff of the SDA.